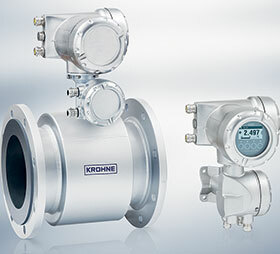 Krohne has introduced the new Tidalflux 2300 F for flow measurement in partially filled pipes. The electromagnetic flowmeter features integrated, noncontact capacitive level measurement and an approval for ATEX zone 1 for use in hazardous environments, especially for the German wastewater market. Tidalflux 2300 F continues the line of Tidalflux flowmeters which have been in the market for more than 16 years. The new addition to the range is designed to provide reliable flow measurement for flow streams between 10 and 100% of the pipe diameter. The accuracy in partially filled pipes is less than 1% of full scale and the accuracy in full pipes is less than 1% of the measured value. The new flowmeter does not require onsite calibration as it is wet-calibrated at factory in a direct comparison of volumes. Due to the presence of H2S in many wastewater applications, the new meter features an ATEX zone 1 approval. Here, the inline flowmeter is a closed measurement solution for a safe and clean working environment, replacing open channel measurements. In addition to creating a toxic and explosive atmosphere, H2S presents another problem, especially for partially filled electromagnetic flowmeters: their electrodes may have only a very short life span when in contact with this strongly corrosive substance. The electrodes of the Tidalflux 2300 F are mounted at a height of 10% from the pipe bottom, ensuring that they are always wetted to avoid corrosion. The capacitive level sensors are integrated in the liner and have no contact with the medium, therefore they are unaffected by H2S and any residues that may be floating on the surface (fat, oil, etc.) or particles in the water. Although municipal or industrial wastewater transport is its main area of application, Tidalflux 2300 F can also be used for measurement of effluent brine from dredging, mining or sea/well water injection applications. Diameters range from DN200-1600, and the measuring tube is fitted with a polyurethane liner which is resistant to abrasion that may be caused by particles such as sand and stones suspended in the brine. It also features a high chemical resistance and minimises the need for regular cleaning as its smooth surface prevents build up of fat deposits. The meter is available with an IFC 300 F (PF) remote converter in field housing. This means that the extended diagnostic functions of IFC 300, including application and device diagnostic as well as the out-of-spec test, are now available for Tidalflux. For subsoil installation or applications in areas that can be partially flooded, meters can be supplied in a protection rating IP68 version with special coating.